SMIDGE OF THIS: Five On Friday - Oh Yes! It's time for another edition of Five on Friday and I do hope you'll join me this week! As a reminder, my cohostesses Darci, Christina, and Natasha are on summer break but will soon return! Last night I was doing a little Zulily shopping and I added three cute items to my cart and was having the hardest time choosing just one. I did a little Instagram poll (find me - @alizadventures) and the winner was the same one I was leaning towards ... this cute number! 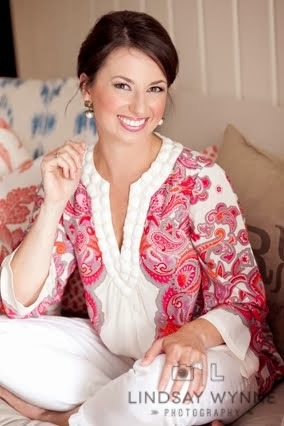 Zulily is one of my favorite spots to score smocked and monogrammed items. Invitations are done by referral links, and if you need one, mine is here. Enjoy your signature overhaul! Please email me so I can put you in contact with Kyle. :) Thanks again, Kyle, for your generous giveaway! If, like me, your favorite flavor of Jelly Belly jellybeans is cantaloupe, and you just can't get enough, then book it over to AC Moore. 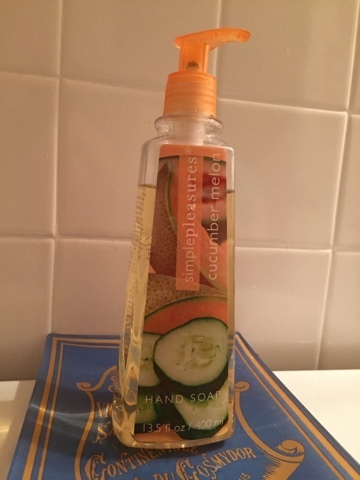 I picked up this Cucumber Melon hand soap (which truly just smells like the ripest, juiciest cantaloupe ever) for a dollar. A dollar. Very fun news ... another giveaway! Courtney from CoraLee was so pleased by all of your sweet responses to my post Wednesday that she has offered to give one of you a weekender bag in the pattern of your choice! You may earn up to two entries by following @shopcoralee on Instagram and/or liking @coraleeboutique on Facebook. Please leave a separate comment on this post for each entry you've earned. You may enter through Sunday at midnight, and I'll announce the winner this coming Monday! We pay entirely too much (TOO MUCH!) to our cable company, and I'm looking at ways to decrease our bill. One option is to lose some of the premium channels we have. I am looking forward to checking out Amazon Prime's video service and am going to take advantage of their free month trial! Anything to shave off a buck or two is always helpful. :) Have you given it a shot yet -- I would love to hear your two cents! Love this bag! I follow CoraLee on Instagram! Love this bag! I follow CoraLee on Facebook! What a cute romper with the smocking! Ohhh I love the weekender tote! Following on Instagram! Following on Facebook! Wish I had the tote this weekend for my girl's trip! Love that bag! Following on Instagram! Liked CoraLee on Facebook. In need of a Weekend bag for baby's stuff! Liked CoraLee on Instagram. Loooooove seeing pretty things in my Insta feed! PS - We have Amazon Prime, so we have free streaming music and tv and movies and everything. But....with a 3 month old, we have YET to check ANY of it out. Can't wait to hear your reviews of everything! Happy FRIDAY! Liked CoraLee on Instagram... they have the cutest stuff!! The CoraLee bag is adorable! I follow on FB! Love the Zulily outfit. Good pick! I liked CoraLee on Facebook, actually just blogged about them in my 5 on Friday as well! Liked Coralee Boutique on Facebook! I also follow CoraLee on Insta! I also follow on Facebook. I just love these bags! liked cora lee on facebook! liked cora lee on instagram! Love that bag! I liked her shop on Facebook! And I'm following on instagram! Love the bag! I like her on FB (Sarah Kreger)! Also follow on instagram (@sbkreger). I would love to win the weekender bag. I desperately need a new smaller bag! We cut the cord a while back, as we just didn't watch TV. The only channel and time we watched was HBO Sunday nights. We purchased a roku and picked up subscriptions to Hulu, Netflix and share our parent's HBO password (ssssh). Even with those subscriptions we save so much! And I can now watch the shows I actually want to watch when I want. Seinfeld is now on hulu... so I'm set! :) Have a great weekend pretty girl! That pink Aztec weekender is my favorite! Perfect for my long weekends down on Cape Cod. Oh cable, it is so expensive. I call every now and then to try and get my bill lowered. They usually lower it for me. But I do have cable, Internet, and phone bundled together. Liked them on FB - love those for travelling! I liked Coraleeboutique on FB and would love a bag!!! AND I followed her on IG! Thanks! I liked Coralee on Facebook! She has adorable stuff!! Also, I followed Coralee on Instagram too! I followed Coralee on Instagram! After moving out of our apt that provided free cable, we've opted out of getting cable at the house. I decided that in a week or so we'll get hulu+... hopefully that works out well! Interested to see how your experience with Amazon Prime is! And liked Coralee Boutique on Facebook! Liked Coralee on Facebook....LOVING the adorable monogram wristlet!! I've loved this bag ever since you put it on IG! Been trying to save money since having a baby, so it would be so awesome to win this!! Liked on IG! Meant I followed on IG! Oops! Those weekenders bags are so cute! I liked Coralee on Facebook (Kayla Miller). I also followed her on Instagram. I could reaaaaally use one of these bags for my honeymoon in September. Also, we cancelled our tv services altogether and now just use Netflix and Hulu for movies and tv shows. Less than $20 a month for both! Love these bags! I need another weekend bag to see my besties!!! Oh. I love that Coralee bag. Following on Instagram now. Following on insta & liked on facebook :) Now that I'm married and have my forever monogram, I'm putting it on everything! Would love this bag! I am following on Instagram...so cute and perfect for travel! I liked Coralee on Facebook! That little onesie is SO cute! We cut our cable a while ago and have Prime, Hulu, and Netflix and we don't miss cable at all! I liked Coralee on FB. I really need to win this bag as I am going with my grandson to the Dizzy Dean 10 and under World Series for baseball next month! It would be a perfect take along. I liked Coralee on Instagram (@dianamariaz). I'm getting married in a few weeks and it'd be so fun to have my new monogram on such a cute bag! I liked CoraLee on FB and would love to win this beautiful bag! I now follow CoraLee on Instagram and would love to win her beautiful bag! I'm following Coralee on Instagram! I love the weekender bag! I am following Coralee on Instagram! I followed on insta and on FB! (As Kaylee Hoffner) How gorgeous! Following on insta. Love the bag! Liked on Facebook...I would love love love this bag! We cut cable two years ago and have never looked back. We started with prime, Hulu and Netflix and just added SlingTV for channels like HGTV, and all the ESPNs. It's been awesome! We won't go back!